Something really exciting happened last week – my friends at the San Francisco Flower Mart, the premiere flower market in the U.S., came onboard as presenting sponsors of the Slowflowers.com directory. This is my other passionate project, and it dovetails nicely with the Slowflowers Podcast. In the works right now, Slowflowers.com is a free online directory to help you find florists, studio designers, wedding and event planners, supermarket flower departments and flower farmers who are committed to American grown flowers. Inside the San Francisco Flower Mart: Connecting Bay Area florists and flower lovers with fresh, seasonal and local blooms. I’m currently raising funds to complete this project via Indiegogo. To date, supporters of American Grown flowers have contributed $11,045 to the campaign, with SF Flower Mart’s $1,000 contribution giving us a huge boost earlier in the week. I happened to be working in SF this past Monday, so I stopped by the management office and grabbed General Manager Bob Otsuka and Jeanne Bose, the SFFM’s marketing/promotions director and social media strategist, for a quick conversation, recorded as a Bonus to the Slow Flowers Podcast. Listen to what Bob and Jeanne say about the Market’s decision to bring their support to the Slowflowers.com launch. It’s fascinating to learn about the history of this amazing center for locally grown flowers – and inspiring to know that we’re on the same path to promote more American Grown Flowers to the floral industry and consumers alike. Seasonal blooms, six days a week. A need for a centrally located market bringing together the three ethnically diverse groups of flower growers was fulfilled with the opening of a market located at 5th and Howard Streets in 1924. As flower growers expanded production areas outside of the Bay Area and as product from other parts of United States came in, the need for a larger more modern permanent facility led to the design and construction of our current market at Sixth and Brannan Streets in the South of Market area of San Francisco. The grand opening of the San Francisco Flower Terminal in September 1956 marked the establishment of an industry icon. 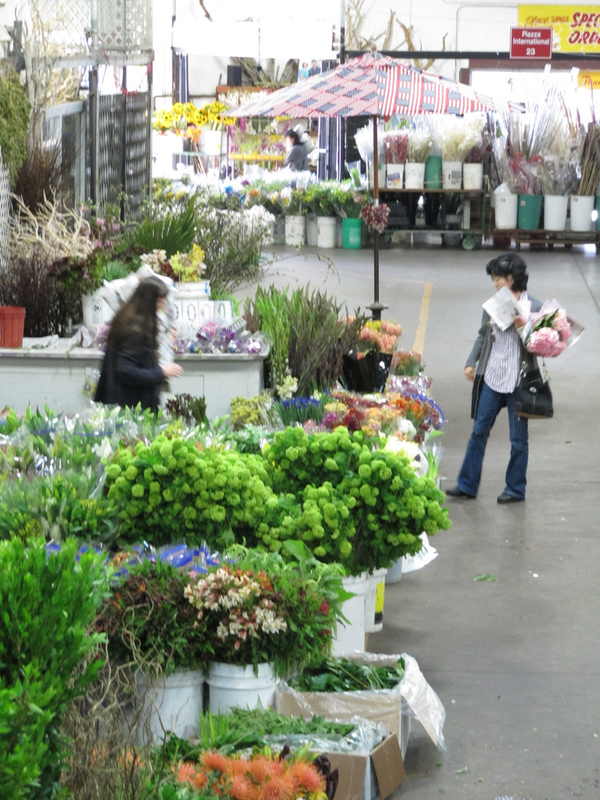 Today, officially known as the San Francisco Flower Mart, we now have over 60 vendors, purveyors of cut flowers, potted plants, blooming plants and floral supplies. 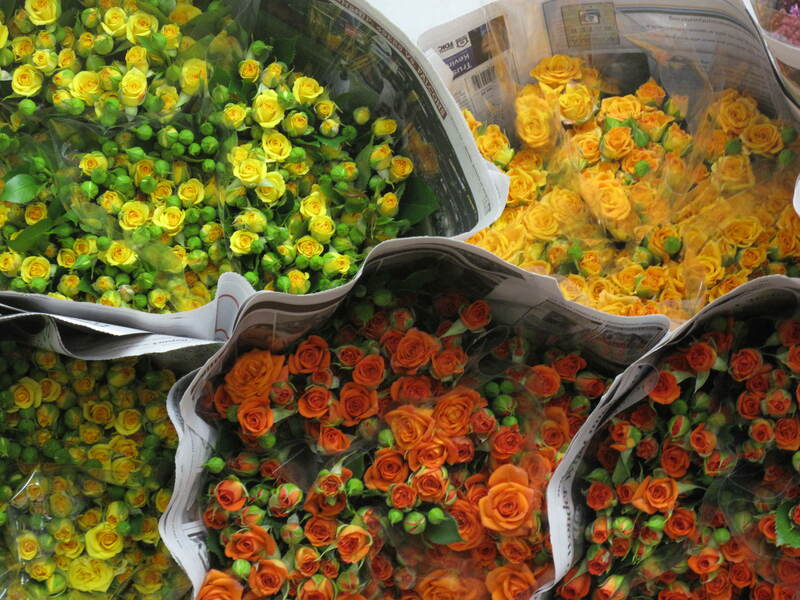 We have evolved from being a “growers” market to being a marketplace for floral wholesalers. Product, which at one time was only from the immediate Bay Area, now comes from the far reaches of the world. 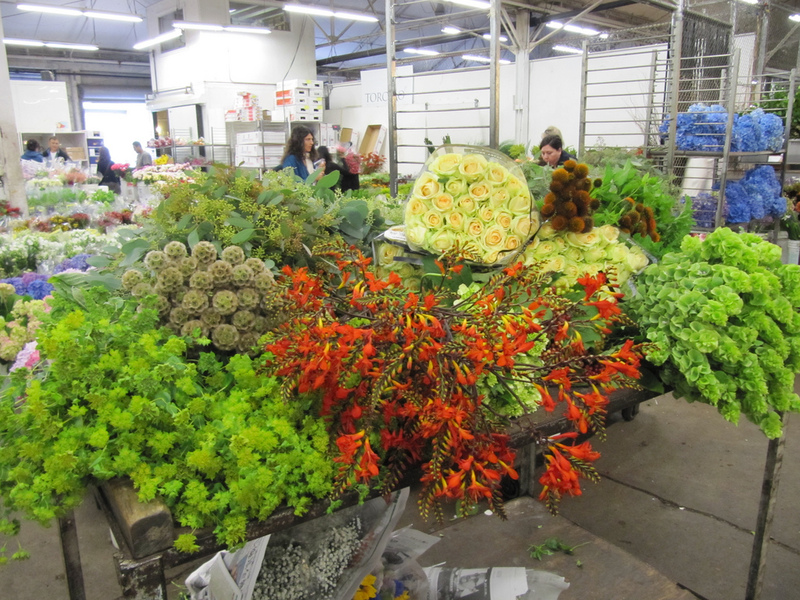 As you will hear in this podcast interview, more than a century after it was established, the San Francisco Flower Mart continues to reflects the character of locally-grown flowers and the farmers who grow those blooms. 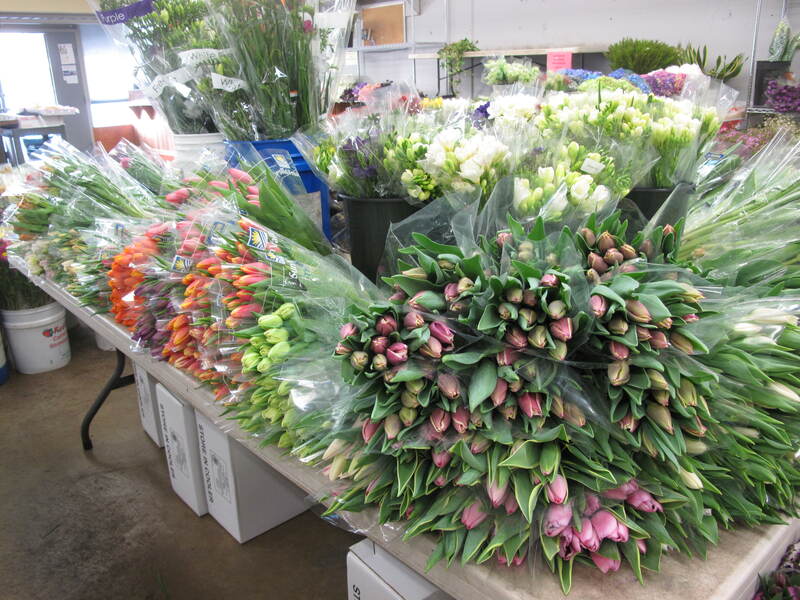 In addition to family flower farms selling direct to the floral industry and consumers, you will also find wholesalers who stock flowers from growers in other parts of California, as well as Oregon and Washington. And while people in “the flower biz” are served here as wholesale customers six days a week, some days as early as 2:00 a.m., the DIY flower lover/designer is also welcome to shop – after 10 a.m.
A bustling center for flowers – with more than 60 vendors. 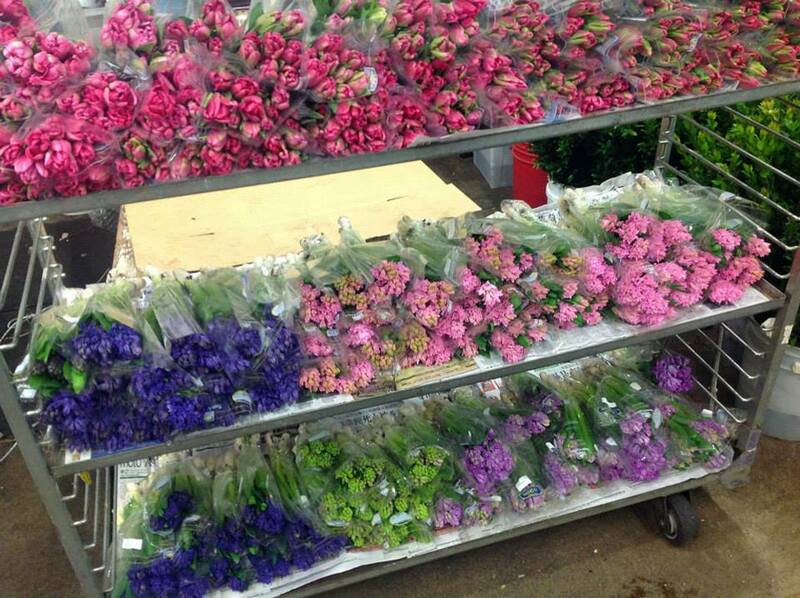 Racks of California-grown hyacinths recently offered by Torchio Nursery, a vendor at the San Francisco Flower Mart. This is truly a flower mecca and you must add it to your flower bucket list if you haven’t been to visit. I’m thrilled to feature the San Francisco Flower Mart and doubly thrilled that this important center for local flowers will be a Presenting Sponsor on the Slowflowers.com site for the year to come, connecting More American Flowers with Customers, One Vase at a Time. This entry was posted on Monday, January 27th, 2014 at 6:07 am	and is filed under American Grown, Blog Posts, Creativity, floral design, General, Podcast Episodes, SLOW FLOWERS Podcast, Slowflowers.com the Directory of American Flowers. You can follow any responses to this entry through the RSS 2.0 feed. You can leave a response, or trackback from your own site. Great bonus piece! Enjoyed hearing Bob and Jeanne from the SF Flower Mart and learning of their support for your campaign. Congrats on the funding! As of this morning, you’re just so close to your goal. Very inspiring. Fantastic that Brannan Street Market is on board. However, I am pretty sure that the hyacinth in the photographs are from Holland, as well as the muscarii. While Brannan Street is a market based in California, they do not have any sort of mandate to sell locally grown flowers. I only bring this up as it is sure to send some kind of mixed message. Earlier you had a clip asking consumers if they knew where their flowers are coming from. Therefore it would be prudent to verify origins and sources of the “Slow Flowers” in your articles/podcasts and be particularly sensitive to an occasion when someone might pose that question to you. Notwithstanding, the movement clearly has touched the sensibilities of many people, and your call to arms is long overdue. thank you David for your clarification. I totally agree with you and I’m working toward better signage, labeling and education, especially at the WHOLESALE level where it is very much needed. I will ask Jeanne Boes of the SFFM to clarify the origins of these flowers you note above. Thanks Debra, We are so excited to be a part of the Slow Flowers movement. Our San Francisco Flower Mart was founded over 100 years ago, by California flower farmers, so we have a long tradition of locally grown product here in San Francisco. As Bob stated in your podcast, product in our market is sourced from all over the U.S., and yes we do also offer products grown outside our borders, to answer the demand of our customers. As it happens, the picture Debra posted of the Hyacinth & Muscari is from Holland; you got it right, David. So you see we do carry a variety from all over the world. I did want to clarify one comment on David’s post, he mention “Brannan Street Market”. We are located on 6th & Brannan Street in San Francisco, and one of the many wholesalers in our market is “SF Brannan Street Wholesale” but please be clear we are the “San Francisco Flower Mart”!